Ideal for cleaning camera, video, lens, binocular, negative, slide, audio, CD, etc. 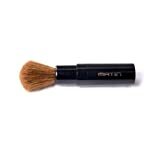 Lipstick style retractable lens brush. This entry was posted in Discount Photography and tagged Brush, Dust, Goat, Hair, M6328, Matin, Size, Small by Ball Photo. Bookmark the permalink.